WESTMINSTER — As students spilled into the quad for lunch, their English chatter was sprinkled with easy Vietnamese: Khoe không? (How are you?) and Sao mày? (What’s up dude?). La Quinta high student Shawna Le, left, 17, chats with Brian Pham, 18, as Kyle Vu, 17, leaps over Blake Lim, 17, during lunch break on Wednesday. Shawna Le’s parents emigrated as children from Vietnam after the war. Food booths for La Quinta High’s Spring Fest offered everything from fettuccine Alfredo to Krispy Kremes. The longest line was for spring rolls with peanut sauce, but plenty of kids opted for McDonald’s fish filet and iced coffees instead. It was, for most, a comfortable blend. 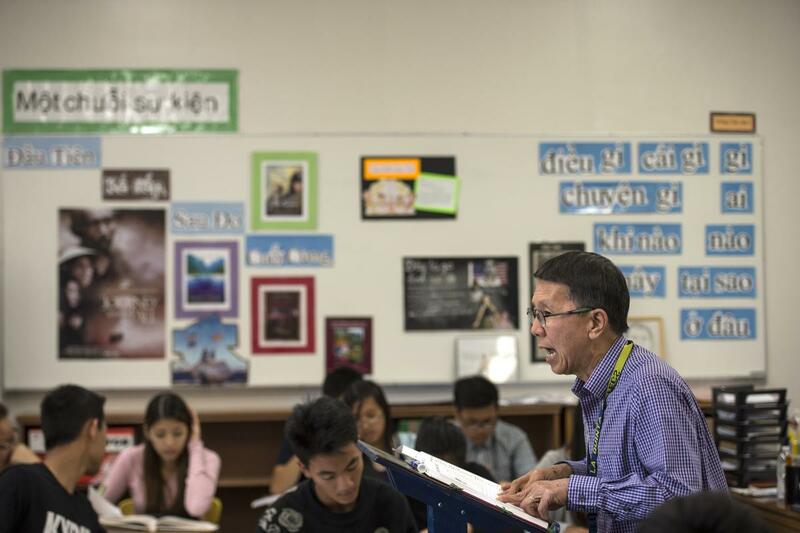 In the now 40-year story of Little Saigon, La Quinta High is a snapshot of the future, a place where cultures and demography blend to form a world that grandparents and even many parents might not recognize. Three out of four students at La Quinta High are Vietnamese-American, the highest such concentration of any high school in America. 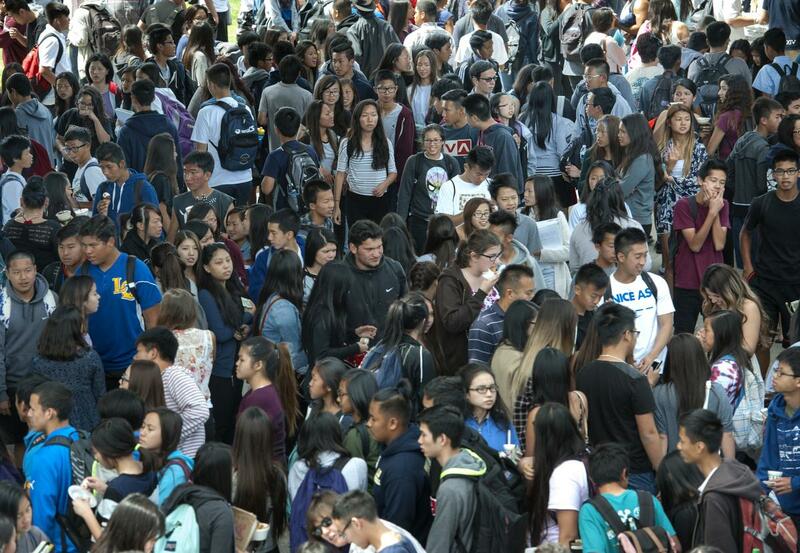 In a county where the public school student mix already is ethnically and racially diverse – 50 percent Latino, 30 percent white, 15 percent Asian – La Quinta, and to a lesser extent some other schools in Little Saigon, stand out. But numbers only hint at the nature of the change that’s taking place. 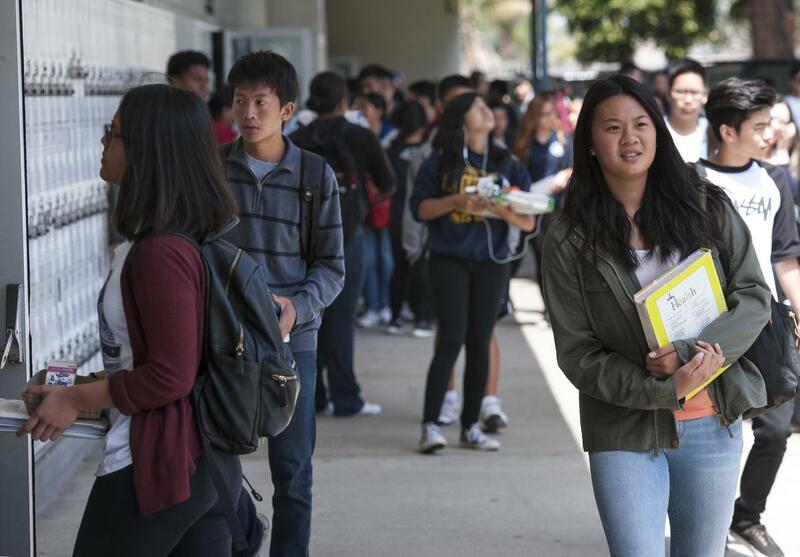 Schools in Irvine, Santa Ana and San Clemente are diverse, too. But at La Quinta, the story is about culture. 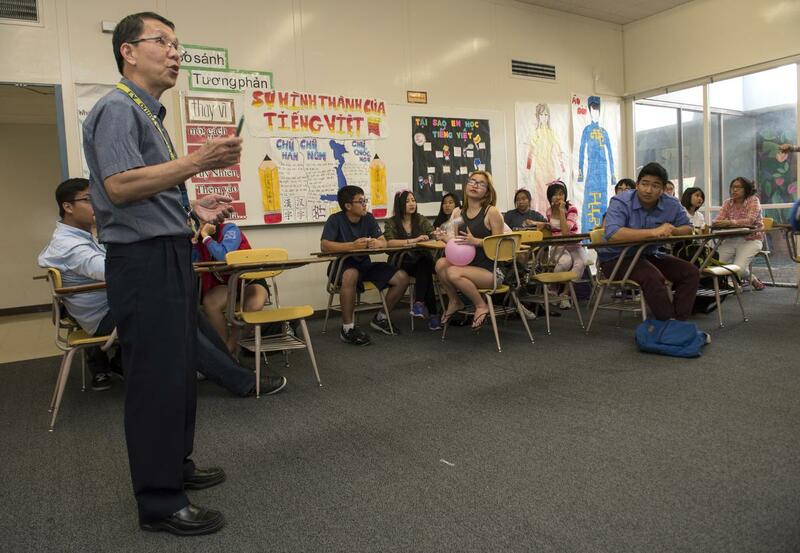 Most of the students are second-generation immigrants, American-born children of the waves of people who came to Orange County from Vietnam in the 1970s or 1980s. They speak English. They surf. They devour movies like “The Fast and the Furious.” They are, in every sense, American teens. But with a little nudge and encouragement from parents and teachers, they’re holding to their Vietnamese heritage, too. They speak the language. They understand the traditions. They know about the history and the politics, even if they don’t necessarily see it the way their elders do. The result is a culture that’s totally new. Every day, junior Shawna Le leaves her fourth-period AP English class, drops her books in her locker, and meets friends at their table in the quad for lunch. Their table is just a few feet from the school’s Hall of Fame, which features dozens of photos that chronicle La Quinta High’s 52-year athletic history. The 1960s and early ’70s show a parade of white students. But over time, there’s a gradual increase in Asian faces, and the most recent photos are almost all Vietnamese Americans. The kids eating lunch barely notice. The 17-year-old Le and her friends gossip about who’s going to prom with whom, they debate who has the toughest teachers, and they plan their after-school and weekend outings. It’s all typical high school stuff. Le’s family story also is typical at La Quinta. Le’s father, Si Le, was 13 when he arrived in the United States. Her mother, Joanna Le, came at age 7. Le and her two siblings – older sister Lauren, a freshman at Cypress College, and younger brother Nathan, a freshman at La Quinta – have lived in Little Saigon all their lives. Le’s bedroom is covered with photos of friends and posters of theLakers. Le and her siblings spend afternoons shooting hoops in their driveway, doing homework or watching television. At school, the teens speak English, but at home their parents have them speak Vietnamese at least half the time. Si Le, who graduated from La Quinta in 1986, just a few years after he arrived in the United States, is a mechanic. The dad remembers a completely different high school. 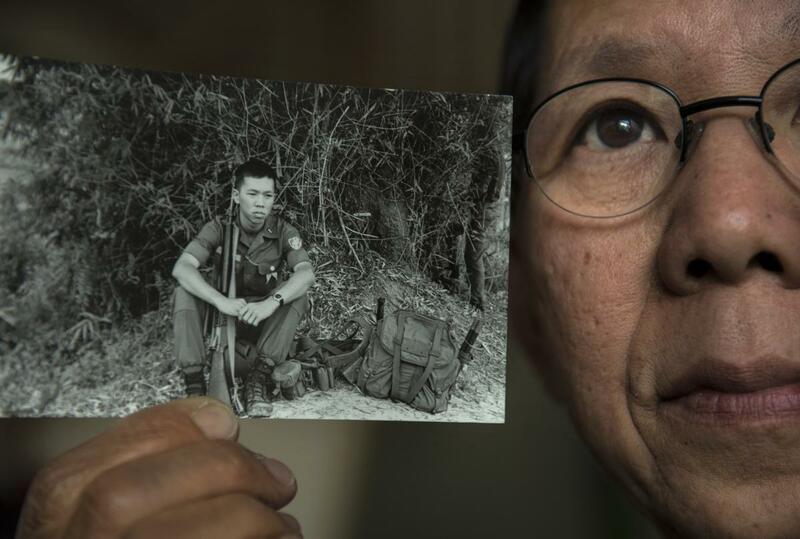 “Back then, there was just a small group of Vietnamese students,” he said. “Many of us didn’t speak a lot of English. We felt different than everyone else. We often got picked on and made fun of. “My children today have it a lot better,” he added. Inside Room 209, Dzung Bach teaches five periods of Vietnamese language and culture. The program was added recently to La Quinta after parents and community members asked for it. About 500 students take the elective class from Bach or another teacher. Bach, 63, runs his lessons almost entirely in Vietnamese, focusing on grammar and pronunciation. The walls of Bach’s classroom tell part of the story at La Quinta. There are maps and pictures of Vietnam, a mix of Vietnamese vocabulary words, artwork from Southeast Asia and photos of La Quinta students wearing traditional clothing in Vietnamese cultural events held on campus. Above the door, Bach has hung an American flag. On the opposite side of the room there’s a flag of South Vietnam. “I wouldn’t say my goal is to teach Vietnamese as a foreign language,” Bach said. Bach was born in Hai Phong in North Vietnam. His family moved to Saigon after the communists came to power. A former lieutenant for the South Vietnamese Army who served seven years as a prisoner of war, Bach arrived in America in 1994. 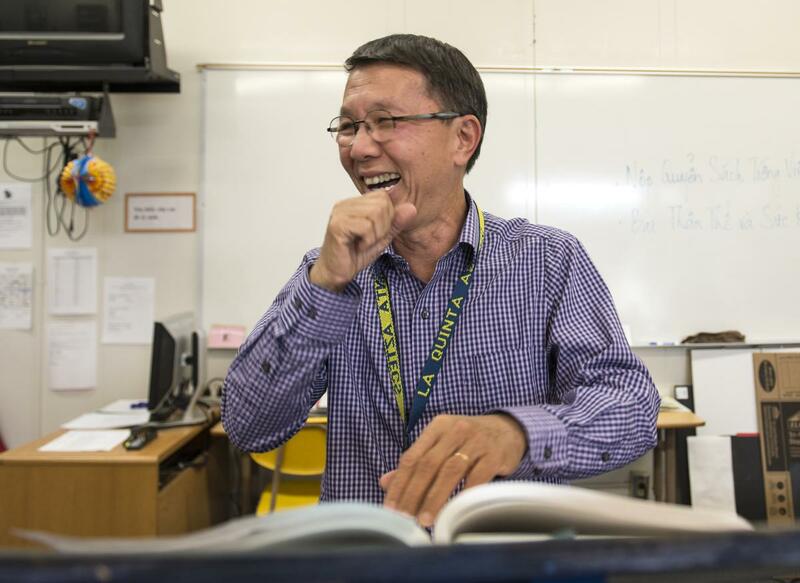 He earned a teaching degree from Cal State Fullerton and has taught for 11 years at La Quinta, where he is one of nine Vietnamese American teachers. Bach weaves his war tales into his daily lessons. Like the one about how, in battle, his platoon was trapped by the enemy along a shoreline after they’d been abandoned by the naval vessels that were supposed to help them escape. Bach was captured and sent to a labor prison camp for five years. He recounts the time he tried to escape the country in an old fishing boat, but the boat came under constant attack from pirates and eventually broke down and was towed back to a Vietnamese port. Bach spent another two years in prison for his failed escape attempt. The teacher often compares growing up in Vietnam with life in America. 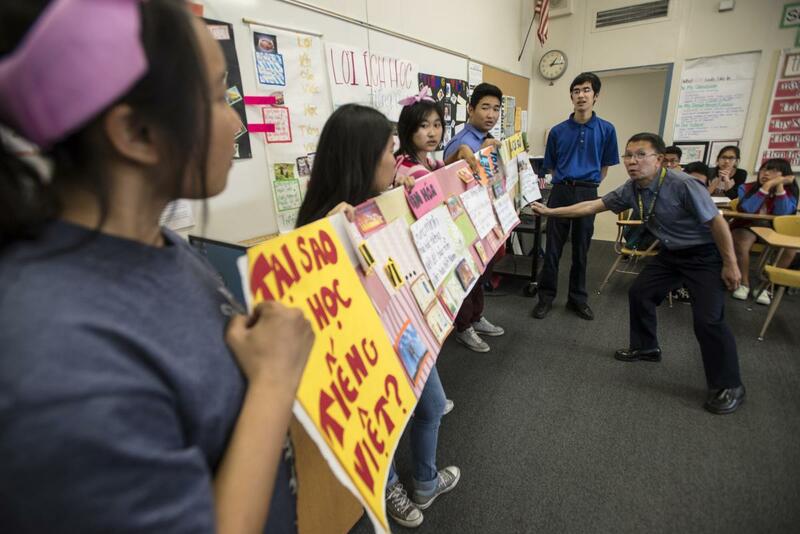 Students laugh when he explains how Vietnamese Americans have more trouble fitting into snug ao dais and ao gams – traditional festive garments – because they tend to be heavier than native Vietnamese, whose diets are a lot simpler. 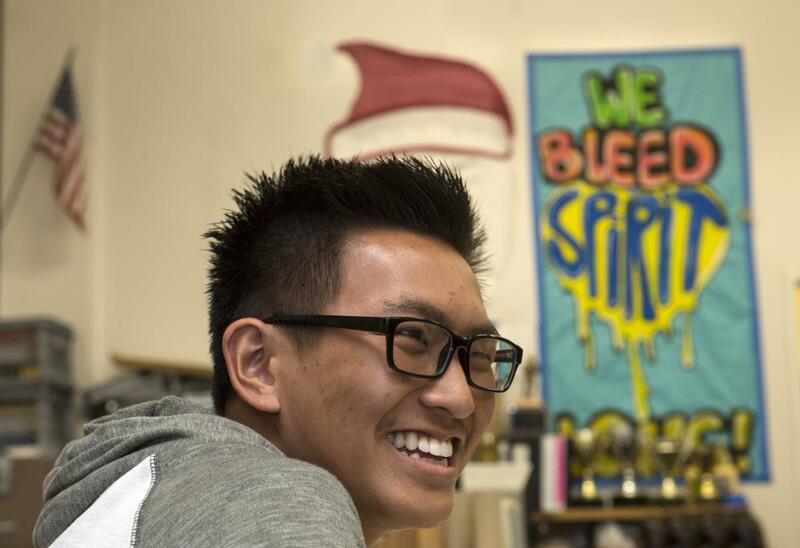 Bryan Hoang, 17, is one of the school’s most popular students, the charismatic president of the student body. He carries a 4.0 GPA and plans to attend UC Santa Barbara in the fall. He’s undecided on his career goals, but math or engineering are in the running. Nearly half of La Quinta’s seniors will attend four-year colleges or universities this fall. That rate is about double the average for California high schools. “I really like being in a position where I can work to make the environment better for everyone,” Hoang said. Last year, Hoang helped organize the prom, held at the Aquarium of the Pacific in Long Beach. This spring, he helped plan the Battle of the Sexes, where boys and girls faced off in a series of challenges such as the quiz bowl, a music lyric challenge and a watermelon-eating contest. The girls won, but it was close. “We let them win,” a boy playfully trash-talked, when recounting the event. “Whatever. You guys keep thinking that,” a girl shot back. Hoang led cheers, high-fived teammates, and congratulated the winners. Senior Khiet Le, 18, is popular too. She is president is of the 200-member La Quinta Vietnamese Student Association, a school group that aims to preserve Vietnamese culture and heritage. Every Friday, the group plans cultural activities and community-service projects. They pass out dinners to needy families at the Westminster Civic Center and spend some Saturdays picking up trash as part of the Little Saigon Clean-Up Day. They often bring in guests from the Vietnamese community to talk with students about issues such as war, immigration and the importance of heritage. During the recent Tet Festival, members of the Vietnamese Student Association performed traditional lion dances in front of classmates during lunch. Some students then gave presentations about the meaning of Tet. “Commitment to community service and cultural awareness are important here at La Quinta,” said the student, who is planning to attend either UC Merced or Cal State San Bernardino. 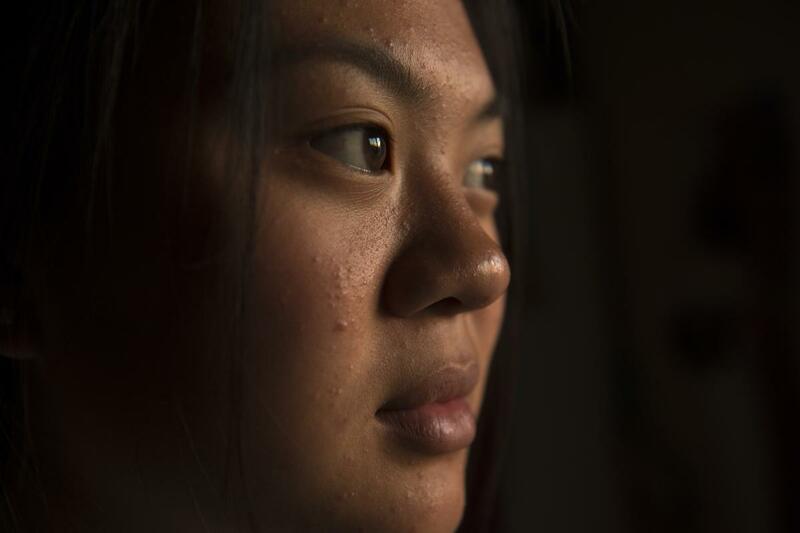 Cecilia Arzaga, 17, is among the 1 in 4 students at La Quinta who isn’t Vietnamese American. Her father is Filipino American and her mother is Mexican American. Other students at La Quinta include people who identify as Korean, Pacific Islander and white, among others. Arzaga, a senior, came to La Quinta in the fall. She used to go to Magnolia Science Academy, a small charter school in Costa Mesa, but transferred because it didn’t offer softball. She had considered four high schools close to her Garden Grove home and chose La Quinta because the school had the highest test scores. She came here wondering whether everyone would speak in Vietnamese and if it would be hard to make friends. 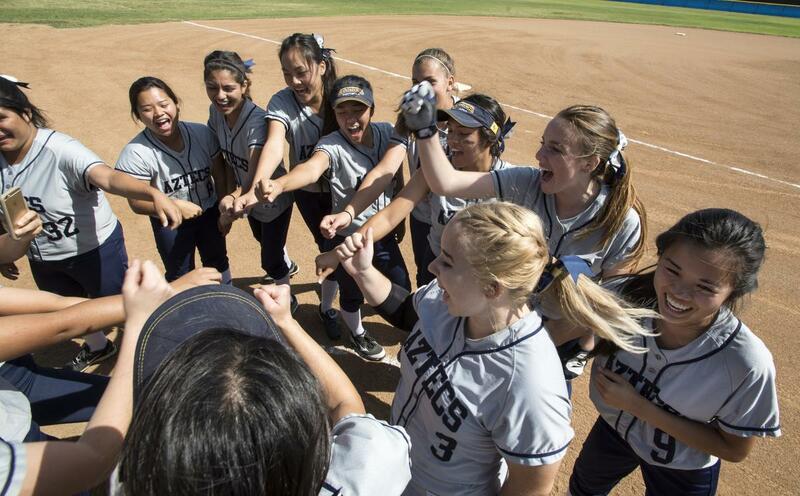 Arzaga, who is deciding between UC Merced and Cal State Fullerton, plays shortstop on the school softball team. She’s batting above .500 and is one of the league’s best players. Mostly, her La Quinta friends are teammates. Her boyfriend, Zakk Morgan, plays third base for the baseball team. After practice, her friends hop into their cars and head to boba tea shops, or stop by Munchies, a nearby sushi bar that also sells French fries, crepes and some Vietnamese food. “By now, I know all the best spots,” she said. Arzaga tried to introduce her friends to favorite Mexican restaurants, but she realized they already knew about them. She and her friends, Arzaga said, are a lot more alike than they are different. “Most students have friends who share the same interests,” she said. 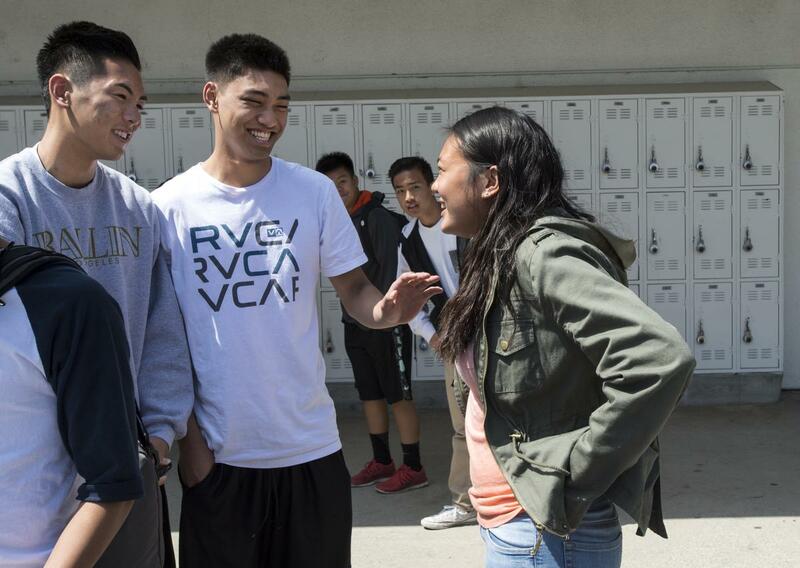 La Quinta high student Shawna Le, 17, meets with her friends since freshman year, Kyle Vu, left, 17, and Kevin Nguyen, 17, during lunch break on Wednesday. Shawna Le’s parents emigrated as children from Vietnam after the war. 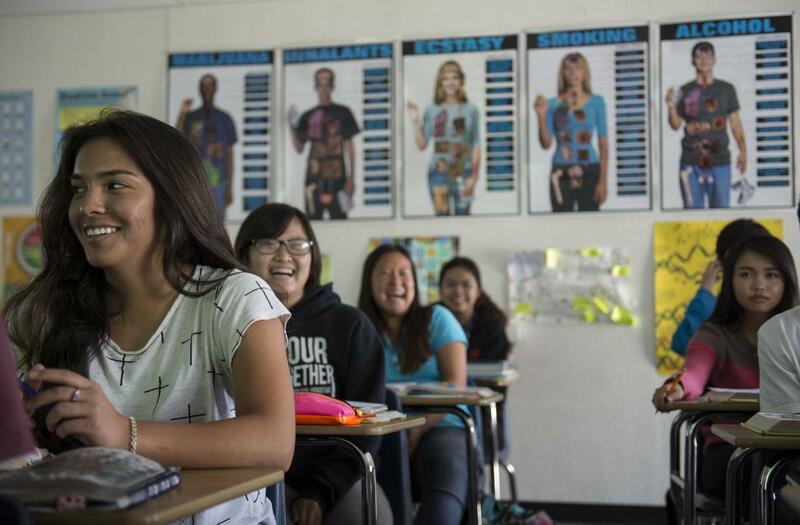 La Quinta high student Shawna Le, right, 17, heads to her next class on Wednesday. SShawna Le’s parents emigrated as children from Vietnam after the war. 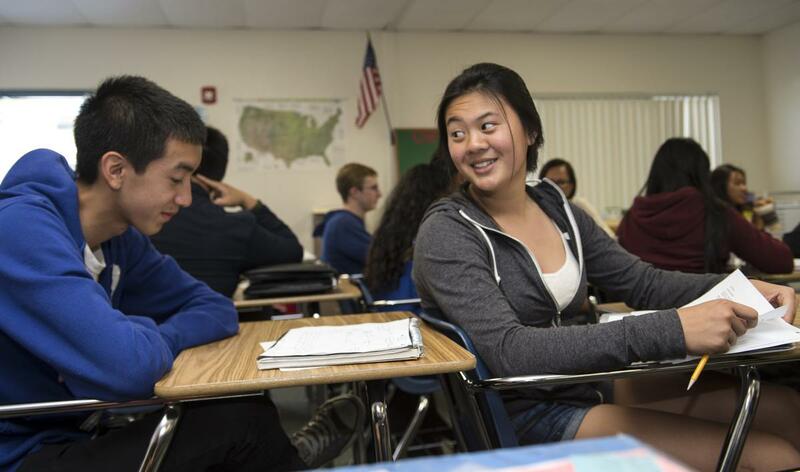 La Quinta high student Shawna Le, 17, discuss an assignment with Andrew Dinh during Daniel Geil’s U.S Government World History class on Friday. Shawna Le’s parents emigrated as children from Vietnam after the war. La Quinta high student Shawna Le, 17, shares a laugh with her friend since freshman year, Kyle Vu, 17, on Friday after school. Shawna Le’s parents emigrated as children from Vietnam after the war. After school La Quinta high student Shawna Le, gazes at the sunset from her room at home on Tuesday. Shawna Le’s parents Si Le and Joanne Le emigrated as children from Vietnam after the war. La Quinta high student Shawna Le, 17, shares a laugh with her friends since freshman year, Kyle Vu, 17, and Aileen Aranda, right, 17, on Friday after school as they head home. Shawna Le’s parents emigrated as children from Vietnam after the war. 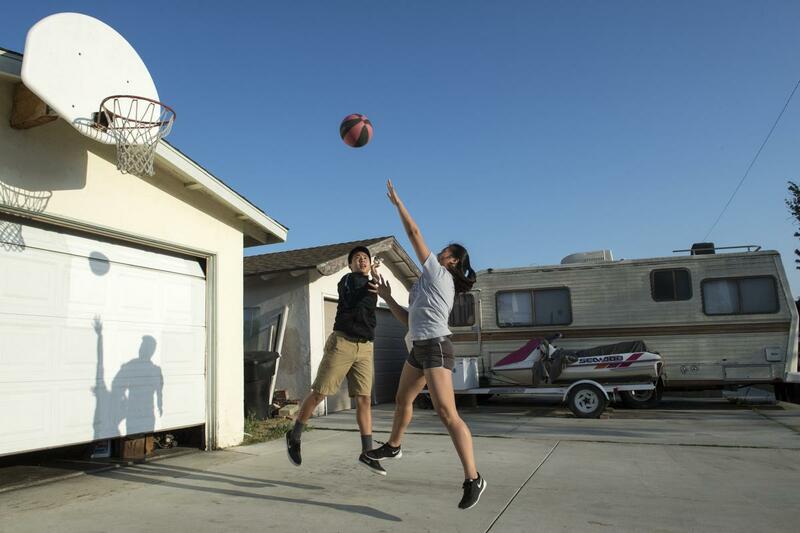 La Quinta high student Shawna Le, plays one on one basketball with her brother Nathan Le, 14, at their home after school on Tuesday. 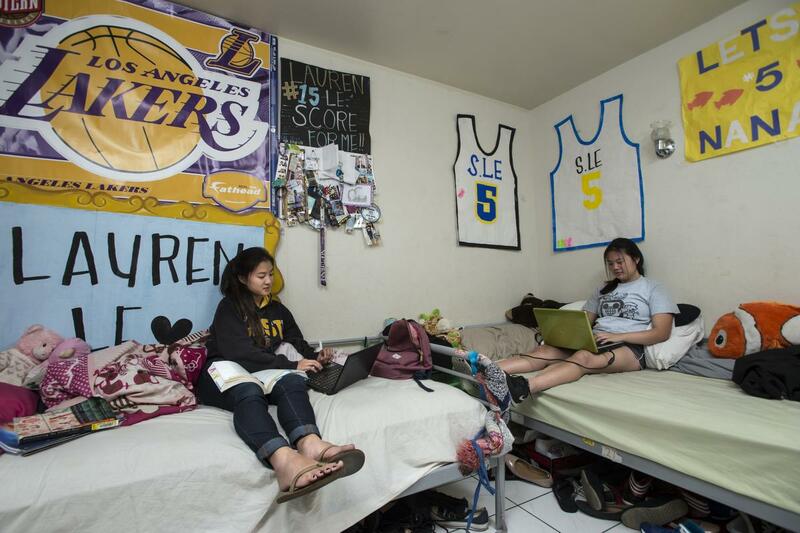 La Quinta high student Shawna Le, 17, right, and her sister Lauren Le, 19, work on their laptop computers in their room while waiting for dinner at their home on Tuesday. 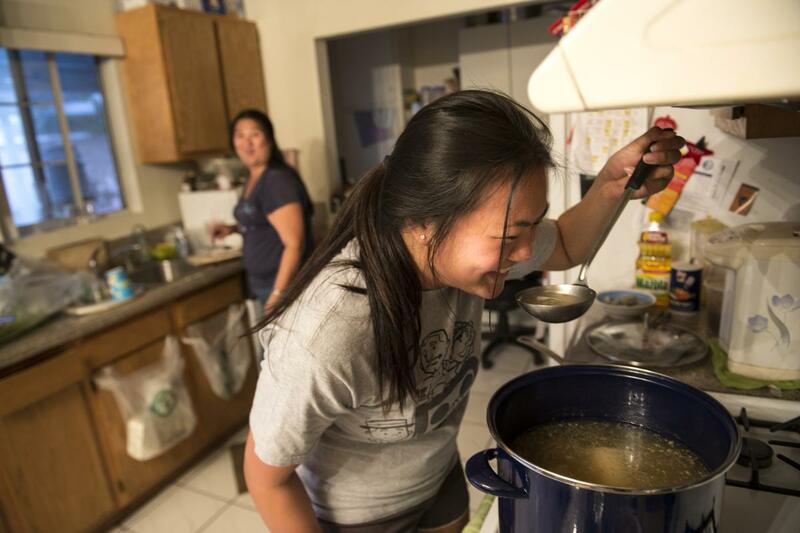 After school La Quinta high student Shawna Le, checks what her mother Joanne Le, left, cooked for dinner on Tuesday. Shawna Le’s parents Si Le and Joanne Le emigrated as children from Vietnam after the war. La Quinta high students gather in the quad at lunch break during a Spring Fest event on Friday. Around 75 percent of the students are Vietnamese-American. La Quinta high teacher Dzung Bach shows a photo of himself at the age of 22, a lieutenant with the South Vietnamese army. Bach served POW while fighting for the South Vietnamese army during the war. La Quinta high teacher Dzung Bach leads a discussion during his fifth period advanced Vietnamese language class on Wednesday. Bach served POW while fighting for the South Vietnamese army during the war. La Quinta high teacher Dzung Bach leads a discussion during his fifth period advanced Vietnamese language class on Wednesday. Bach served POW while fighting for the South Vietnamese army during the war. La Quinta high teacher Dzung Bach leads a discussion during his fifth period advanced Vietnamese language class on Friday. 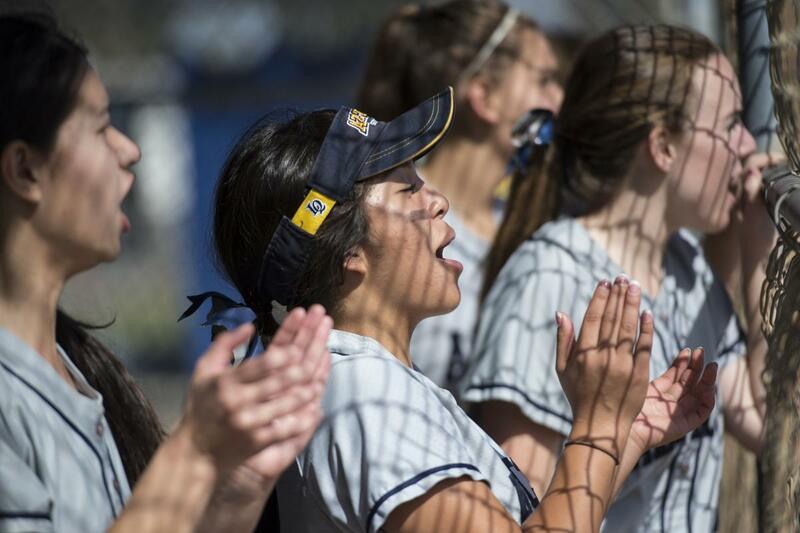 La Quinta high student Cecilia Arzaga, 17, 4th from the right, cheer with teammates before their match against Santa Ana Valley High School on Tuesday. La Quinta high wins with the score of 14 to 0. Cecilia Arzaga transferred to La Quinta at the start of the school year to join the softball team. She is one the 25 percent of students who isn’t Vietnamese-American. La Quinta high teacher Dzung Bach, right, leads a discussion during his fifth period advanced Vietnamese language class on Friday. La Quinta high student Cecilia Arzaga, center, 17, cheers for her teammate during a game against Santa Ana Valley High School on Tuesday. La Quinta high wins with the score of 14 to 0. Cecilia Arzaga transferred to La Quinta at the start of the school year to join the softball team. She is one the 25 percent of students who isn’t Vietnamese-American. 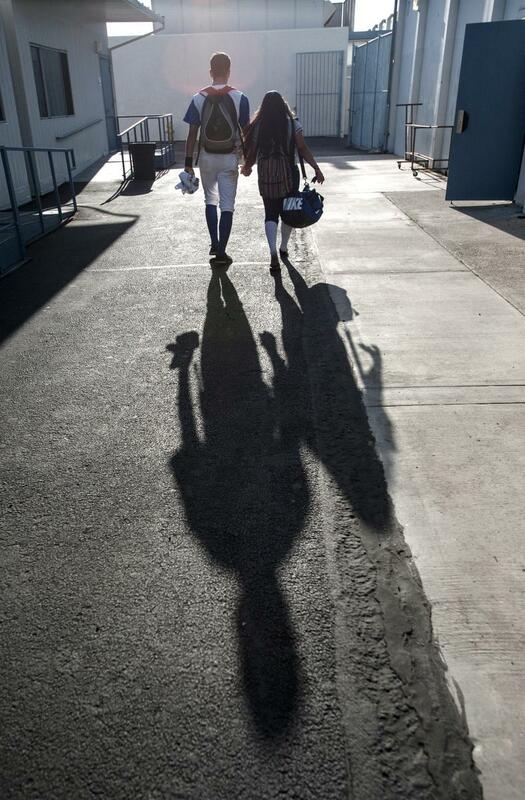 La Quinta high student Cecilia Arzaga, 17, walks with her boyfriend Zakk Mogan 17, after their games on Tuesday. Cecilia Arzaga transferred to La Quinta at the start of the school year to join the softball team. She is one the 25 percent of students who isn’t Vietnamese-American. La Quinta high student Cecilia Arzaga, 17, is all smiles as she meets her boyfriend Zakk Mogan 17, after their games on Tuesday. Cecilia Arzaga transferred to La Quinta at the start of the school year to join the softball team. She is one the 25 percent of students who isn’t Vietnamese-American. La Quinta high student Cecilia Arzaga, left, 17, listens to teacher Laura Carroll during Health Education class on Wednesday. Cecilia Arzaga transferred to La Quinta at the start of the school year to join the softball team. She is one the 25 percent of students who isn’t Vietnamese-American. 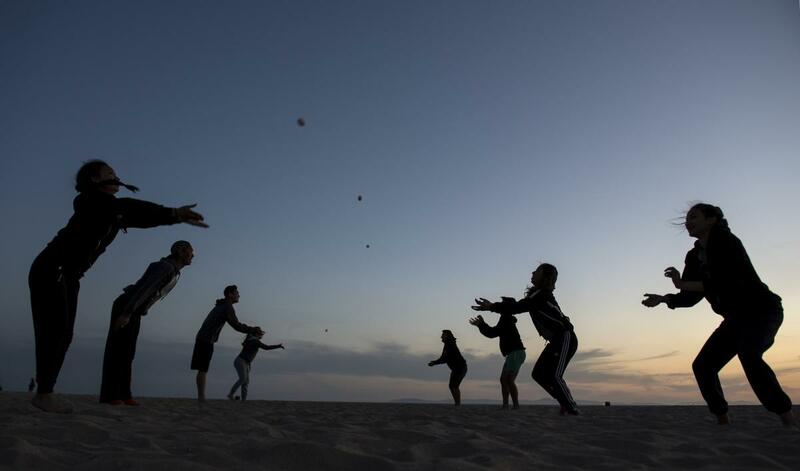 La Quinta high student Bryan Hoang, second on the left, 17, plays a game of egg toss with ASB student members during spring break on Wednesday at Huntington Beach. Bryan Hoang, 17, is La Quinta’s ASB president. The senior will attend UC Santa Barbara this fall. He’s unsure what his career goals are, but they involve math or engineering. La Quinta high student Bryan Hoang, 17, starts the meeting with ASB student members on Tuesday. Bryan Hoang, 17, is La Quinta’s ASB president. The senior will attend UC Santa Barbara this fall. He’s unsure what his career goals are, but they involve math or engineering. 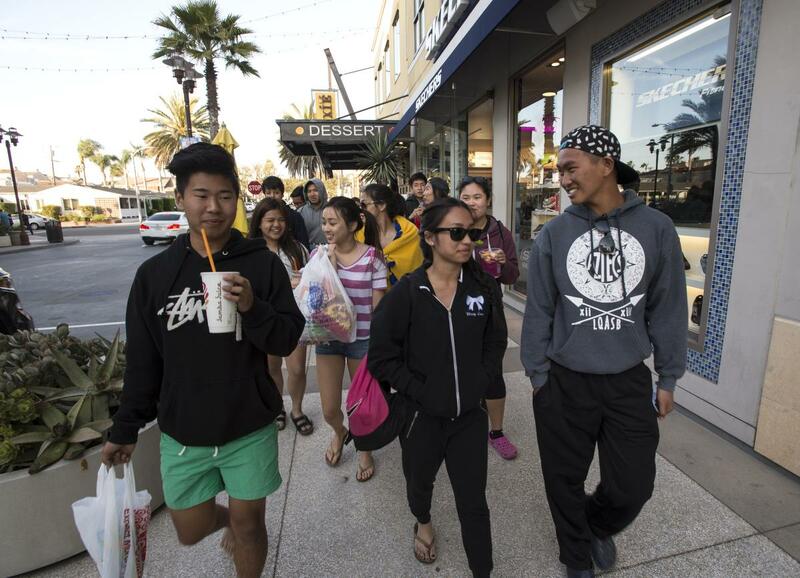 La Quinta high ASB president Bryan Hoang, right, chats with ASB student member Christy Luong, 17, as they and other members stroll around Huntington Beach during spring break on Wednesday. 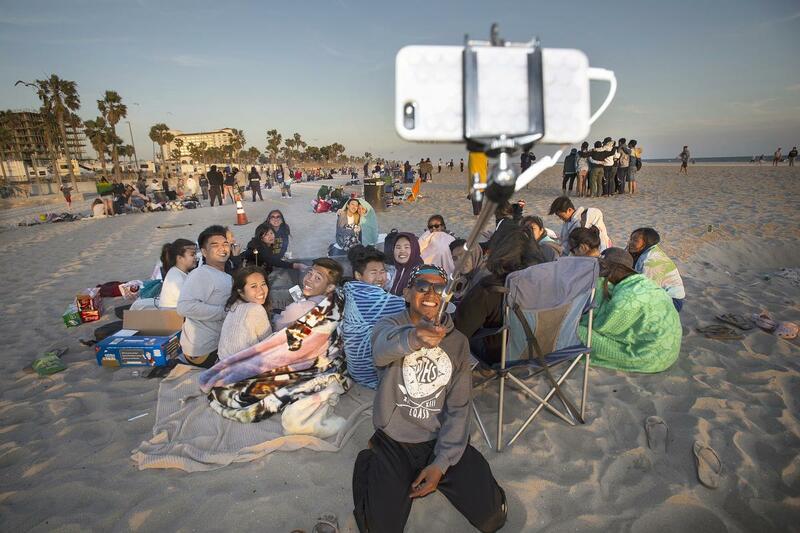 La Quinta high ASB president Bryan Hoang, center, 17, takes a photograph with fellow ASB student members at Huntington Beach during spring break on Wednesday. Bryan Hoang, 17, is La Quinta’s ASB president. The senior will attend UC Santa Barbara this fall. He’s unsure what his career goals are, but they involve math or engineering. 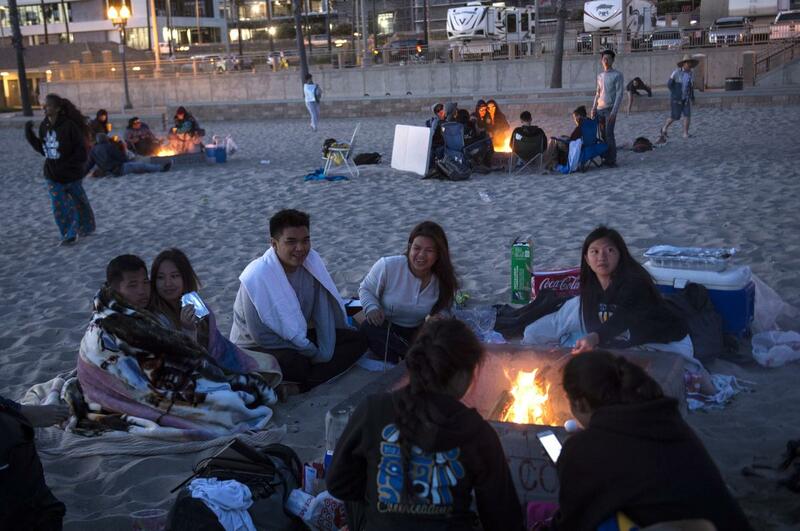 La Quinta high ASB student members Benjamin Nguyen, left, 17, and his girlfriend Ashlee Vo, 16, huddle around a fire with fellow members during spring break on Wednesday at Huntington Beach. 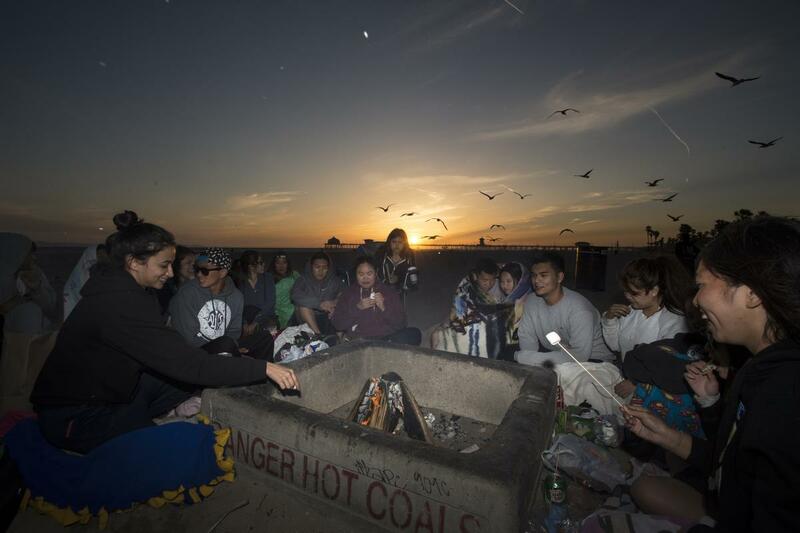 The sun sets as La Quinta high ASB student member Diana Dao, left, 17, and fellow ASB student members huddle around a fire during spring break on Wednesday at Huntington Beach. 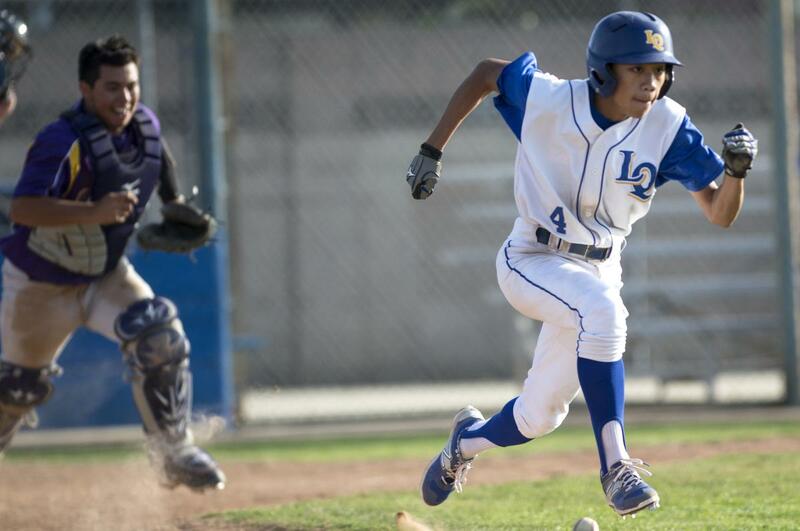 La Quinta high student Thien Pham, 17, sprints to first base during a game against Santiago High School on Tuesday. La Quinta High wins with the score of 3 to 2. Thien Pham, 17, plays centerfield on the La Quinta varsity baseball team. The senior was born in the U.S. His parents arrived in California following the war. La Quinta high ASB student members Benjamin Nguyen, 17, and his girlfriend Ashlee Vo, 16, huddle around a fire during spring break on Wednesday at Huntington Beach. 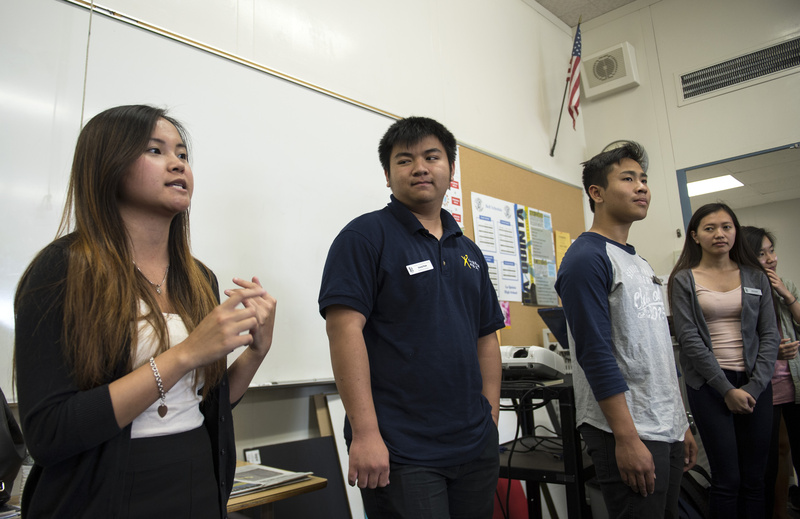 Senior student Khiet Le, 18, left, Vietnamese student president, addresses the group during a meeting at La Quinta High School during lunch break on Friday.